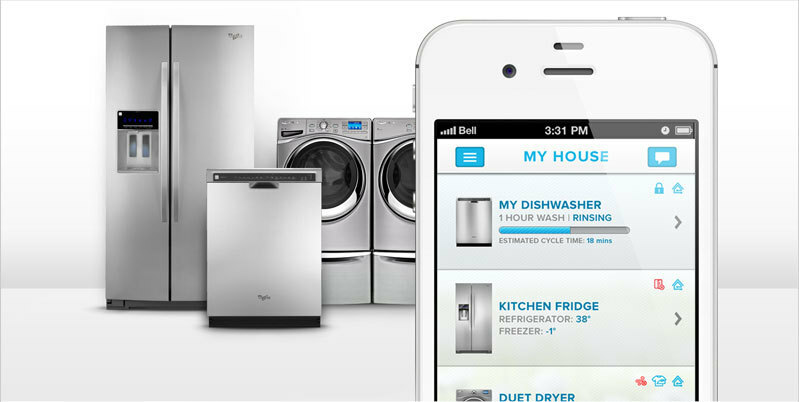 The new connected appliances from Whirlpool. It’s been more than a month since I returned from Las Vegas and the 2013 Consumer Electronics Show. And while many a techno geek is still probably fantasizing about the cool new super thin, super crisp TV’s (and the booth babes who displayed them), I can’t get my mind off something else. Though I am loathe to admit it, the (not even so) new crop of smart appliances are haunting my dreams. Part of it is my own, sorry set of appliances, none of which are manufactured by companies that even exist anymore. My 15 year old refrigerator, by the so under the radar you’d think is was defunct Amana, is starting to go both physically (falling shelves), and functionally (everything in the fruit and veggie drawers freezes!). My Stove is by Magic Chef, a company that doesn’t even manufacture stoves anymore. It no longer heats up all that well – so many’s the time I’ve called everyone in for dinner only to find out the chicken was still a bright, bloody pink! So imagine how I felt, looking at the beautiful new Whirlpool White Ice appliances. Sleek. Beautiful. Presumably NOT freezing everything and properly cooking everything. Just seeing them got me thinking that Stainless Appliance are just so…aughts. Plus, some Whirlpool® Appliances have 6th Sense Live™, which let you manage your refrigerator temperature, lock your dishwasher control console or know when your cycle is done. They can even help you save on energy costs, just by tracking usage. The gas range in the collection offers super-fast pre-heating (mine takes forever), a big giant window to see what’s cooking without disturbing temperature (not that I need that option, since my current oven is never at the proper temperature anyway), and a built in convection option, for even faster cooking and better browning (I got nothing.). It wasn’t just Whirlpool, I drooled over the awesome (and not yet available) Samsung T9000 which has a 10-inch Wi-Fi-enabled touchscreen and includes apps such as my favorite Epicurious for recipes and Evernote for note-taking. The refrigerator’s grocery manager helps you keep track of what you’re putting into itand lets you set an expiration date with a simple drag and drop interface. Then, when the time comes, a note pops up on the screen letting you know what’s about to expire. Next thing, they’ll have built in calorie counters, so you don’t overeat. Or built in Soda Streams. Oh, wait. Samsung just announced that, too. Sadly, in this the year of the B’nai Mitzvah, all I can do is wait at home for the refrigerator repairman tomorrow. Because frozen lettuce makes a really lousy salad. And my kids can wait for a roast chicken. No matter how hungry they are. Love this. 5 years ago I fell in love and was seduced by a Dacor oven. I had a perfectly fine not fancy oven. Hated it for 5 years. Couldn’t bake in the oven because the temp changed erratically. I finally bit the bullet and bought a GE and love, love, love it!!! Oh Nancy! I too am drooling over that Epicurian delite of a regrigerator… I know I just have to have it… to go with my new kitchen… the redecorating spruce up that has become a major kitchen remodel on a non-existent budget…. but for the kids wanting to go to college lacrosse and soccer camps this summer in hopes of getting seen and learning something that makes them noteworthy to colleges anywhere willing to offer them money to play for them… oh, if not for those little things I would be able to get my dream fridge… but hey, my new glass stove top finally arrived! and it only took 3 months! Now I can cook on 5 burners in stead of just one! I’m still dreaming. especially since the repair guy told me mine is irreparable! Too old and he can’t get me parts anymore. Right now, we’re using duct tape. Seriously.